Stop the execution of Troy Davis - An innocent man! TOP: Troy Davis. MIDDLE: ANSWER organizer and Howard student Eugene Puryear addresses protesters at a campus rally organized by Students Against Mass Incarceration, Sept 16. 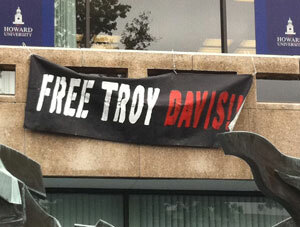 BOTTOM: Free Troy Davis banner hangs at the Howard University campus. Send a free fax right now to the Chatham County District Attorney. The members of the politically appointed Georgia Board of Pardons and Paroles, impervious to any accountability to the people, have decided that they wish for Troy Davis to die. 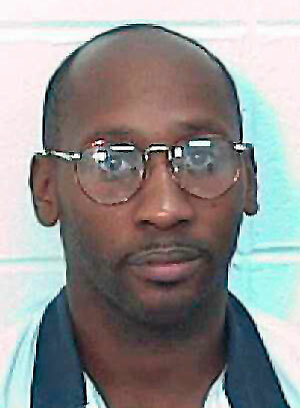 With their announcement today that they have denied clemency to Troy Davis, he is on course to be executed this Wednesday, Sept. 21 at 7:00 pm Eastern, in the state of Georgia. Absolutely no physical evidence has been found that implicates him in the killing. No murder weapon has ever been found, exposing yet another major gap in the prosecution’s case. This is the fourth time the state of Georgia has set an execution date for Davis, who was wrongly convicted of killing a police officer in 1989. 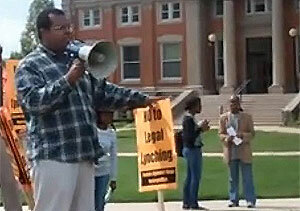 There is worldwide opposition to Troy Davis's execution. On Sept. 16, coordinated protests took place in cities all over the United States and the world. Take action right now! Send an immediate free fax by clicking here that will go tell the Chatham County's District Attorney Larry Chisolm to seek a withdrawal of the death warrant. It will only take seconds—we have made our online free fax tool available for ANSWER supporters. You fill out your letter, or customize our sample letter, and we will dispatch the fax immediately.